Tug boat MV Captain BIM spraying the lower deck of ferry boat MV Gem Star with water in an effort to contain the fire yesterday morning. Fire broke out twice on the lower levels of the MV Gem Star yesterday, while the boat was anchored at the Grenadines Wharf in Kingstown. 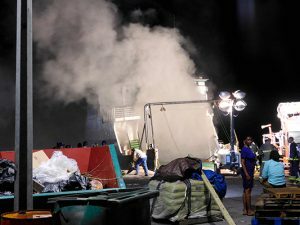 The fire first began sometime around 10 Monday morning, reportedly due to a welding incident on board the vessel, an employee of the boat told SEARCHLIGHT. When SEARCHLIGHT arrived on scene yesterday morning, police officers were manning the entrances of the wharf, where throngs of people lined up alongside vehicles, waiting for police to grant permission to board other boats travelling to the Grenadines. A fire, which broke out yesterday morning on the MV Gem Star anchored at the Grenadines wharf continued to blaze well into the night. Others gathered behind fences to catch a glimpse of the fire-fighters and crew members as they worked to put out the fire. Efforts to put out the fire were doubled when the MV Captain Bim arrived on scene and began spouting streams of water in to the lower level of the boat through open areas where puffs of smoke were escaping. The SVG Coastguard was also on scene, with one of its rhibs floating close to the vessel and the Captain Hugh Mulzac on standby, further out in the harbour. The puffs of smoke subsided sometime around 11am, but it is said that the fire reignited again in the evening at around 6 pm. 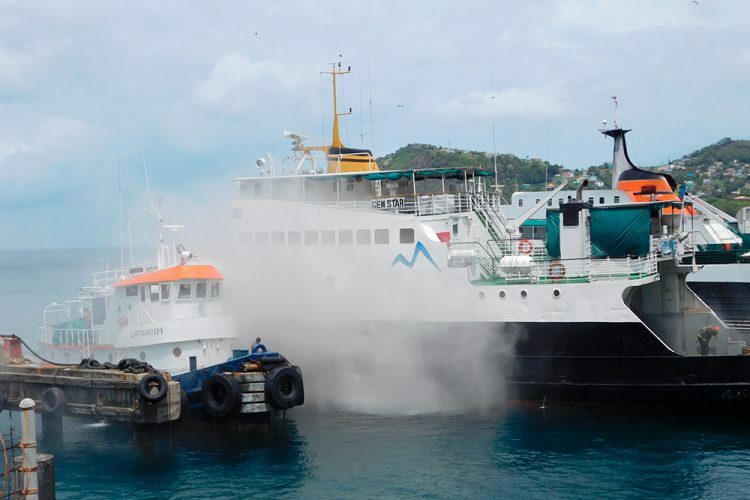 When SEARCHLIGHT returned to the scene, the SVG Fire Service was stationed outside of the boat on the wharf and a few persons looked on as thick clouds of smoke escaped through the open spaces of the boat. Edwin Snagg, the director of Grenadines Affairs said that the fire is going to significantly impact movement of people and cargo to and from the Grenadines. “Barracuda probably came back couple months now and here we are, we’re back to square one. 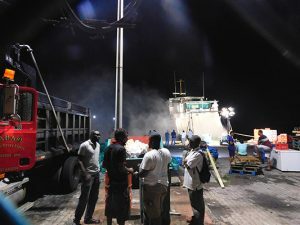 The Barracuda is basically more ferry oriented and what has happened at this time is that Gem Star, really is indeed the cargo boat for the people of the Southern Grenadines…anything that interferes with the movement of people is significant and the impact is going to be felt,” he told SEARCHLIGHT. The owners of the vessel declined to comment on the matter at this time.